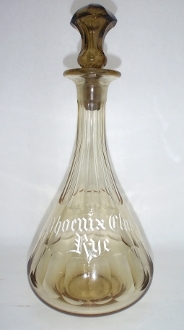 Phoenix Club Rye Amber Back Bar Bottle Decanter. Rare brown amber cut glass decanter. Neck is paneled and bulb base is paneled. Decanter alone is 9 1/2" & with stopper 12". Bottle shows typical scratches and chips from usage. Most wear at the throat and lip of the bottle. The stopper sits deep in the throat and has a bit of a wobble, which makes me believe it is not original to the bottle. Bottle has great eye appeal and will display nicely in any collection.